Disney World is every America’s child dream destination and some don’t stop visiting it even as grown-ups. It’s the country’s and world’s most famous amusement park and most people visit it at least once in their lifetime. 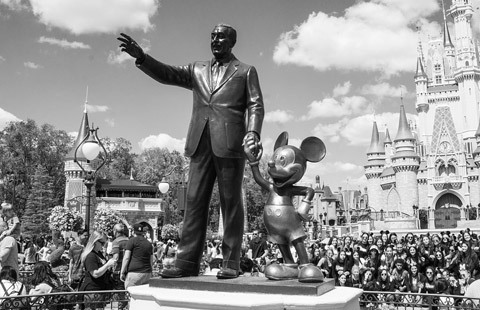 Set somewhere between Orlando and Kissimmee, Disney World is the number one reason why most tourists visit this city. Large groups of tourists require great means of transportation. You can arrive through Orlando International Airport, Port Canaveral or some other way. Unfortunately, ground transportation does not always meet the numbers and needs of tourists that come here all year round. Sometimes they are overcrowded, sometimes insufficiently cleaned and sometimes they are simply not available. The best way to avoid any transportation-related stress to Disney World is to book a limo in advance through our website or by dialing our phone. If by any chance you are going straight from Orlando International Airport to Disney World, you can call us and our limo will be waiting for you in front of the airport. Our chauffeur will carry your bags and in less than half an hour, you will be at the Disney World gates. Most probably, you will first want to leave your luggage and check in at your hotel. We can then wait in front of the hotel entrance to take you and your family to the magical world of Disney. Make sure to book your round trip on time so that we can come and pick you up from the Disney World and take you back to your hotel. We’ll be happy to help you catch your flight once your Orlando vacation is over and it’s time to head back to Orlando International Airport. It is not a secret that most people docking at Port Canaveral have only one destination in mind – Disney World. They want to lose as little time as possible in the transportation, but sometimes options at the very port are less than satisfying or even nonexistent. To make the most out of your time in Orlando, you just have to book our limo service in advance and our chauffeur will be in front of your cruise terminal, ready to start the engine and take you to Disney World in no time. You can count on us once it’s time to head back to your cruise ship as well. There’s no better way to bring some adventure into your Daytona Beach vacation or have a change of pace than going on a day trip to Disney World. It’s about an hour long ride that will pass in no time in our comfortable and spacious limo. In case you are traveling with kids, our SUVs have DVD players and WiFi so your children have something to do on the way. In the meantime, you can relax and save your much-needed energy for your walk around Disney’s magical town. You can call us when you are heading back to Daytona Beach, too. There is plenty of space for your children to have a rest after their busy day. We tailored our Disney World limo service to suit any passenger and any family. Our fleet has a wide variety of vehicles that can fit any group and any family. However, we have kept our prices affordable, because we want you to enjoy your time in Orlando and not stress about the transportation and getting from one destination to another. Let us make your Orlando visit one of the best trips you will ever make and enjoy everything that the Magic city has to offer from the back of our luxurious limousines.